On the rare occasion that Sylvania has an emergency on its hands, the Sylvanian Families Ambulance is always on call to react to incidents quickly. It's packed full of emergency supplies to enable the paramedic Thomas Nightingale to patch up the accident prone patient, Owen Bearbury. The ambulance is always sparkling clean and well maintained. Thomas Nightingale is well known for his excellent driving and ability to help casualties with all manner of knocks and grazes. Thomas's ambulance is brilliantly kitted out with all the necessary gear to deal with accidents and injuries. A stretcher with wheels, blanket to keep patients warm and cupboards full of emergency supplies are all on hand. 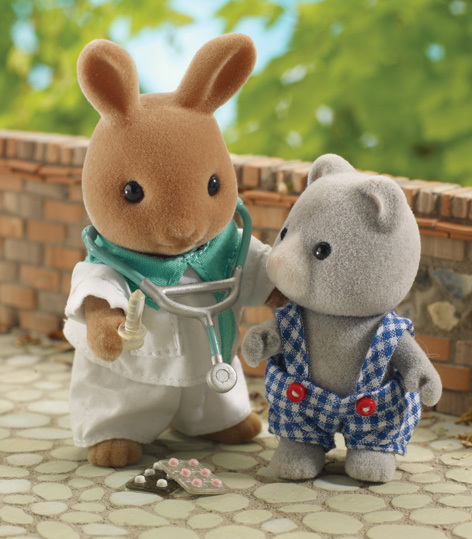 This time, Owen the little bear has suffered a bump to the head and Thomas is able to apply first aid with a bandage from his bag. 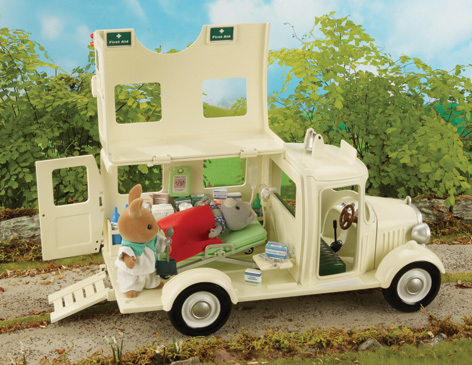 Please tell us what you think of the Sylvanian Familes Ambulance by Sylvanian Families and Flair.